"Man in the Moon Postcard "
A postcard addressed to Miss Ethel Johnson in Glastonbury Connecticut December 26, 1906. A handwritten note appears to read, "in care of Mr. Batchler," and had been crossed out and re-written to say "Bacheler." 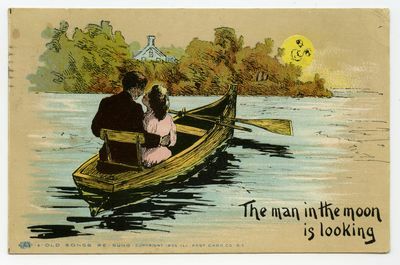 The card reads "The man in the moon is looking," and "4 Old Songs Re-Sung - Copyright 1905 ILL Post Card Co. N.Y."